How to generate a volcano plot from RNA-seq data? Volcano plots are commonly used to display the results of RNA-seq or other omics experiments. A volcano plot is a type of scatterplot that shows statistical significance (P value) versus magnitude of change (fold change). It enables quick visual identification of genes with large fold changes that are also statistically significant. These may be the most biologically significant genes. In a volcano plot, the most upregulated genes are towards the right, the most downregulated genes are towards the left, and the most statistically significant genes are towards the top. To generate a volcano plot of RNA-seq results, we need a file of differentially expressed results which is provided for you here. To generate this file yourself, see the RNA-seq counts to genes tutorial. The file used here was generated from limma-voom but you could use a file from any RNA-seq differential expression tool, such as edgeR or DESeq2, as long as it has the required columns (see below). The data for this tutorial comes from a Nature Cell Biology paper, EGF-mediated induction of Mcl-1 at the switch to lactation is essential for alveolar cell survival), Fu et al. 2015. This study examined the expression profiles of basal and luminal cells in the mammary gland of virgin, pregnant and lactating mice. Here we will visualize the results of the luminal pregnant vs lactating comparison. Import the differentially results table. Name the limma-voom_luminalpregnant-luminallactate file DE results and the volcano genes file volcano genes using the galaxy-pencil (pencil) icon. Check that the datatype is tabular. If the datatype is not tabular, please change the file type to tabular. Click on the galaxy-eye (eye) icon and take a look at the DE results file. It should look like below, with 8 columns. First we will create a volcano plot highlighting all significant genes. We will call genes significant here if they have FDR < 0.01 and a log fold change of 0.58 (equivalent to a fold-change of 1.5). These were the values used in the original paper for this dataset. In the plot above the genes are coloured if they pass the thresholds for FDR and Log Fold Change, red if they are upregulated and blue if they are downregulated. You can see in this plot that there are many (hundreds) of significant genes in this dataset. Why does the y axis use a negative P value scale? The negative log of the P values are used for the y axis so that the smallest P values (most significant) are at the top of the plot. You can also choose to show the labels (e.g. Gene Symbols) for the significant genes with this volcano plot tool. You can select to label all significant or just the top genes. The top genes are those that pass the FDR and logFC thresholds that have the smallest P values. As there are hundreds of significant genes here, too many to sensibly label, let’s label the top 20 genes. As in the previous plot, genes are coloured if they pass the thresholds for FDR and Log Fold Change, (red for upregulated and blue for downregulated) and the top genes by P value are labelled. Note that in the plot above we can now easily see what the top genes are by P value and also which of them have bigger fold changes. Which gene is the most statistically significant with large fold change? Csn1s2b, as it is the gene nearest the top of the plot and it is also far to the left. This gene is a calcium-sensitive casein that is important in milk production. As this dataset compares lactating and pregnant mice, it makes sense that it is a gene that is very differentially expressed. We can also label one or more genes of interest in a volcano plot. This enables us to visualize where these genes are in terms of significance and in comparison to the other genes. In the original paper using this dataset, there is a heatmap of 31 genes in Figure 6b (see the tutorial here if you would like to see how to generate the heatmap). These genes are a set of 30 cytokines/growth factor identified as differentially expressed, and the authors’ main gene of interest, Mcl1. These genes are provided in the volcano genes file and shown below. We will label these genes in the volcano plot. How many of the genes of interest are significant? Which gene of interest is the most statistically significant? 29/31 are significant, the genes with the red and blue labels. 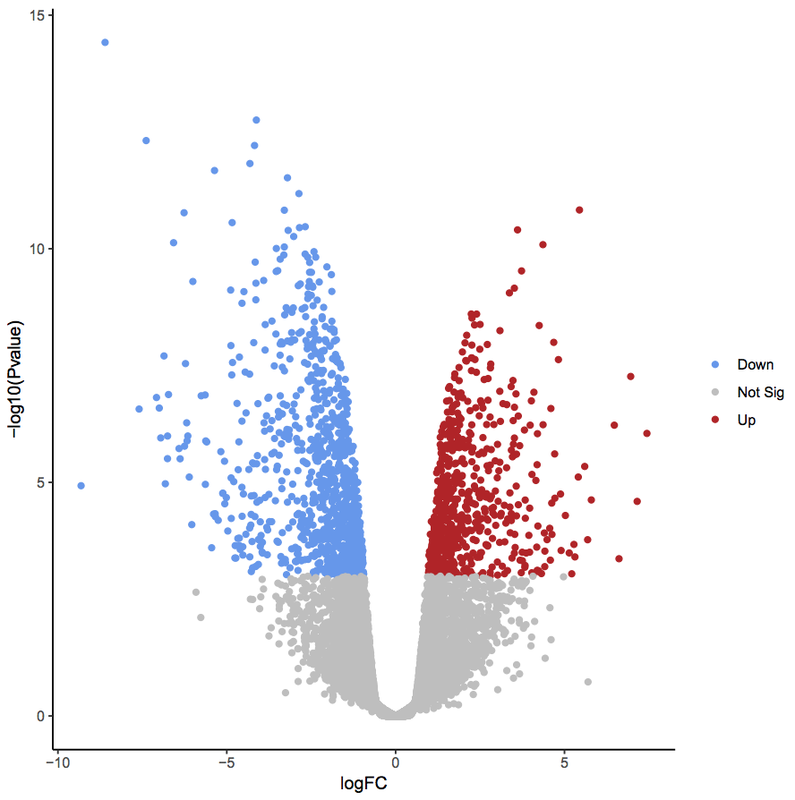 The Egf gene is the most statistically significant as it is nearest the top of the plot. As in the previous plots, genes are coloured if they pass the thresholds for FDR and Log Fold Change. The genes of interest in the file we supplied are labelled and also coloured red or blue if they pass the thresholds. 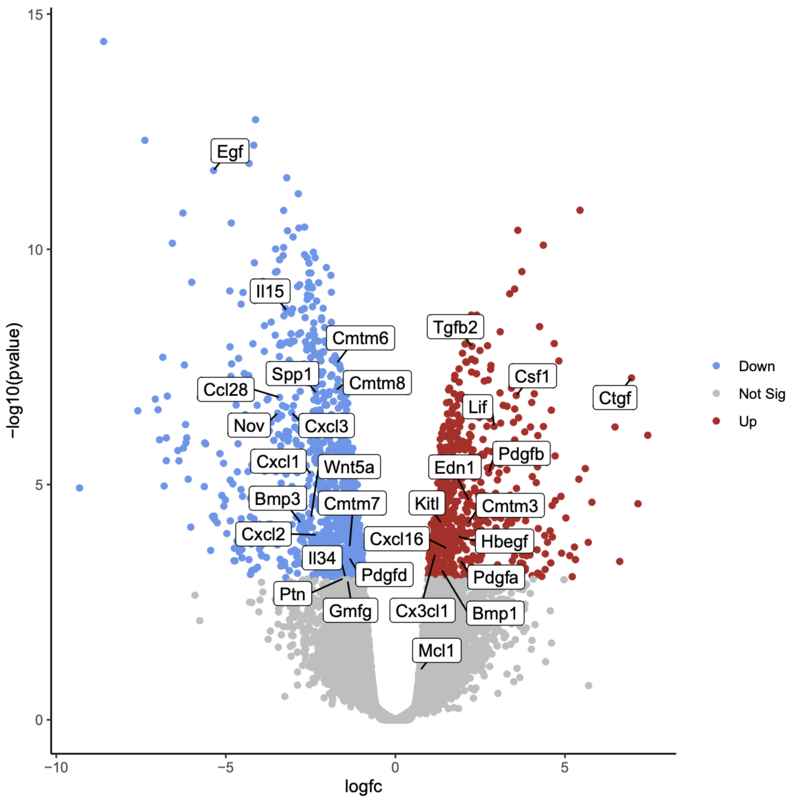 Here all the genes of interest are significant (red or blue) except for two genes. One is the authors’ gene of interest, Mcl1, and this result is expected, as they showed it’s expression did change, but it was not significant at the transcription level. The other gene Gmfg, has an FDR just very slightly outside the significance threshold we used of 0.01 (0.0105). In this tutorial we have seen how a volcano plot can be generated from RNA-seq data and used to quickly visualize significant genes. This material is the result of a collaborative work. Thanks to the Galaxy Training Network and all the contributors ( Maria Doyle)!